Being one of the leading Dish Landing Table Manufacturers and Suppliers, we make sure that our products are all made from high class materials which are obtained from the best of vendors making them long lasting, durable and high performance based. Steel Dish Landing Table which is one of our specialties is the most sought after product in the market due to their corrosion resistance, high durability and strong built properties. 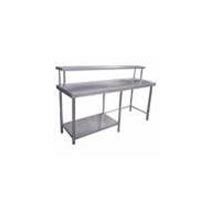 Dish Landing Table widely used for handling dirty dishes. Designed to perfection, our Dish Landing Table is available with a sunk-in top in heavy stainless steel and a built-in garbage chute.